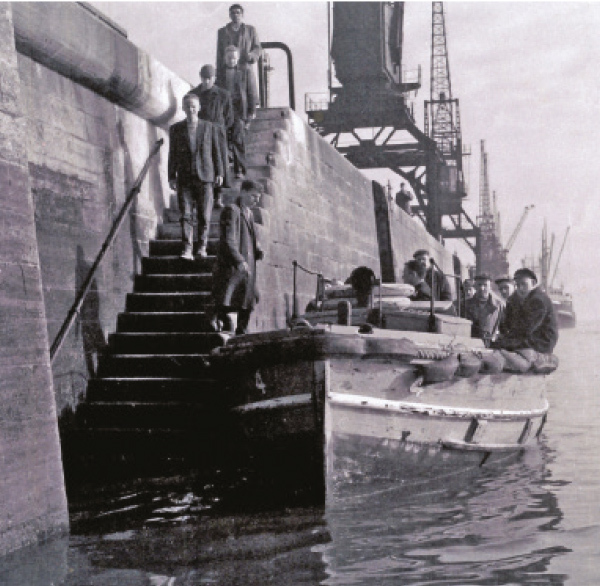 Dublin dock workers being collected in Ringsend. Courtesy of Shane O’Neill Photography. The year was 1984 and the opening of the East link Bridge meant the end for the ‘Dockers’ taxi’ – the ferry service crossing the river, 35 years ago. A bit of banter during the short speeches on board the MV Cill Airne before he got back on board with Jim Murray and Lord Mayor Nial Ring, plus other representatives from Dublin Port and the DCC. What the chairman of St. Patrick’s Rowing club definitely did do, was take care of the boat after its services were no longer needed to shuttle dock workers from north to south and vice versa. The Dublin Port Company bought the boat back in 2016 and restored it for €300,000 in a joint venture between the company and Dublin City Council. He also recalled the beginning of the ferry service, thanks to the Royal charter signed off by the English monarch Charles II in 1665. In practice, this means, that 8-10 young adults from the inner city and docklands areas are offered a six-month long opportunity to gain practical marine experience and a formal qualification accredited by the Irish Sailing Association. They will be learning how to drive the vessel, skippering, boat maintenance, repairs – the essentials of a seaman’s work from experienced and now retired seamen. After the blessing, the No.11 made its first trip over to Sir John Rogerson’s Quay on the South Side. The official route is from the 3Arena to Sir John Rogerson’s Quay to MV Cill Airne at North Wall Quay and back. There are 18 bench seats, nine on each side and no standing room as it used to be. The dockers’ taxi is back for a short cut across the river rather than via the East Link or Samuel Beckett Bridge. The regular ferry service will begin Monday 11th February and run weekdays between 7am-7pm. The fee for one three-minute crossing is set at €2, Leap Card and cash accepted. All fares will contribute to the overall funding of the training programme.